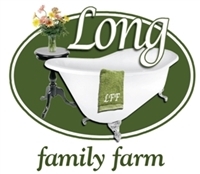 Long Family Farm Goat Milk Soap is made from locally sourced goat milk. We keep these scents in stock all year long. Different scents for different seasons. Goat’s milk is also rich in vitamins and nutrients important to healthy skin, including zinc, alpha hydroxy acid and amino acid, as well as vitamins A, B, C and E.
If you use goat’s milk soap on a regular basis, you will likely find that your skin requires less moisturizer. 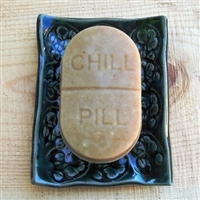 Soap Dish by Sue Davis of Visual Joy Studio Patchouli & Cassia Goat Milk soap is an all natural cold processed goat milk soap made from goat milk, coconut oil, olive oil, soybean oil, palm oil, cocoa butter, patchouli and cassia essential oils and sodium hydroxide. Lavender Oatmeal Goat Milk soap is an all natural cold processed GOAT MILK soap, made from goat milk, coconut oil, olive oil, soybean oil, palm oil, cocoa butter, lavender & ylang-ylang essential oils, sodium hydroxide and oatmeal. Soap Dish by Barbara Campbell of Wood N Potter Thieves Oil Type soap is an all natural cold processed Goat Milk soap made from goat milk, coconut oil, olive oil, soybean oil, palm oil, cocoa butter, Rosemary/Eucalyptus/Lemon/Clove/Cinnamon (Equal parts) Essential oils, sodium hydroxide.